Slice the chicken breasts in half, like a bun, and lightly pound until ¼ inch thick. Slice the jalapenos in half lengthways and clean the middle. Mix the cream and cheddar cheeses together. Spoon about 1 tablespoon of the cheese mix in every jalapeno half. 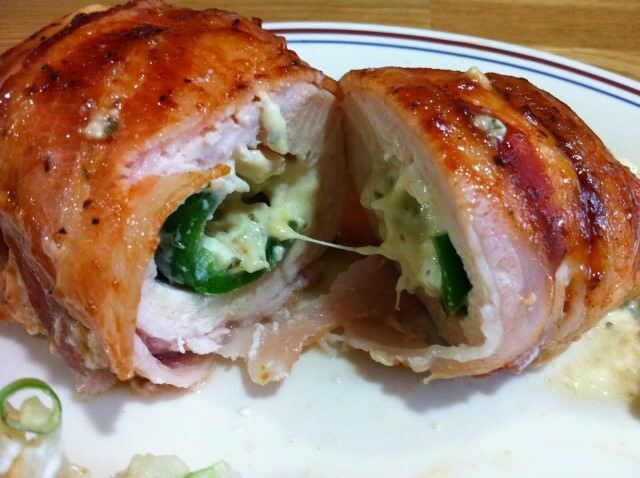 Wrap each jalapeno half in a chicken half as fully as possible. Wrap each roll with 2 pieces of bacon. Place the rolls in a baking dish and bake for about 30 minutes or until the chicken is cooked through. Turn and baste each roll with barbecue sauce after every 5 to 10 minutes.